My Top 5 Festival Tips. If you're heading to Reading Festival (known to us locals as Reading Rock), Leeds Festival or any other festivals this weekend or upcoming weekends you may want to read this post for some festival guidance and tips! I've lived in Reading my whole life (27 years!) and with Reading Festival, WOMAD and Rewind all within a close range, it's fair to say I've been to more than enough festivals to know how to have the best festival experience! From festival attire to festival parking, the local area, and all the essentials, hopefully this post will come in handy for any festival plans you have! Whether you're an experienced festival goer or a festival newbie there's something here for everyone, but the most important thing is you stay safe and have lots, and lots, and lots of fun! Step One: Where Are You Sleeping? The question that's always first on my list because of my love for sleep is where will I be sleeping!? Every festival I've attended has seen me camping because the cost of glamping or hoteling isn't something I wish to fork out on. If you're camping check out my handy guide to camping, if you're planning on staying in a nearby hotel or bed and breakfast then you need to book months in advance to secure a night, don't be tempted to find somewhere on the night, especially in somewhere like Reading, we're only 25 minutes away from London and because of this - on a normal weekend it can be hard to find a hotel or b&b let alone festival weekend! Festival attire isn't a must, but a lot of us attend festivals in attire we'd not usually wear! If you've just come back from Rewind South that took place in Henley this weekend then your luggage I'm guessing was full of 80's attire including shell suits, wigs, neon sweatbands, tutu's, leg warmers and the rest. If you're attending somewhere like Reading, then I'm guessing you're planning to go in with the short and wellie look! Festival attire can be one of the biggest cost of the weekends aside from the weekend festival ticket, and to save cost it may be worth spreading the cost of your festival attire, find out more at justcatalogues.co.uk but in the meantime, pack a pair of wellies that are actually waterproof and not just fashionable, because sadly it always seems to rain come festival time! You've got your ticket, bed for the weekend, attire and hopefully transport sorted, but what about the other festival essentials? One thing that's worth noting here is the fact that you can travel to the festival lighter if you don't mind buying your essentials local, however it depends on where abouts the festival is being held. 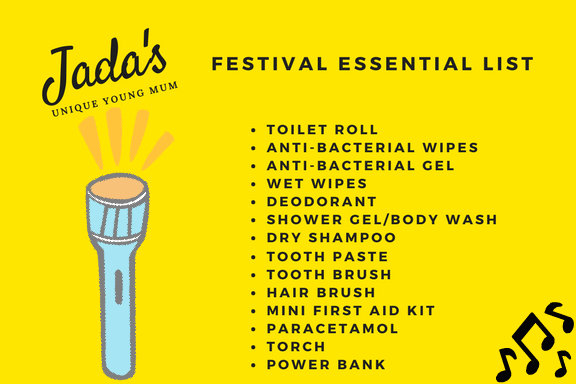 If you're attending Reading or Leeds, chances are the local stores have stocked up (ordered in extra) on essentials like toothpaste, shampoo and toilet roll, but with places like Rewind South, do you want to go on that big trek for the essentials, only to struggle back to the campsite? Check out my essential list below! Step Four: Do You Really Need That!? Following on from the essential list above, is ''Do You Really Need That?'' I'm not talking about the toilet roll as that's an essential, but I'm talking about the eyelash curlers, the years supply of make up you've packed and your mums whole medicine cupboard. Not only will it weigh you down but you'll soon realise most of it wasn't used when you come home, instead it was just extra weight for you to carry or more room taken up! Step Five: Stay Safe and Prepare For Emergencies. Sadly we don't ever know whats around the corner, and whilst all of us plan to have the best weekend ever, sadly sometimes emergencies do happen taking the festival experience to a whole different meaning. As my essential list mentions, pack a mini first aid kit, a power bank for your phone, and find out where the nearest A&E unit is, it's also worth finding out where the onsite medical tent is. Make a plan with friends in case of a severe emergency like a campsite/festival evacuation and terrorist threat. A few years ago the risk of a terrorist related incident wasn't something you'd consider, but in today's day it's worth making a plan incase something happens. Don't plan to meet your friends near the campsite/festival entrances, instead plan to meet them a mile or so away from the festival, this will ensure you're far away from the danger instead of putting yourself at a potential risky spot. If there is anything I've missed, please do let me know below! Ways To Revamp Your Home On A Budget. Are You Ready To Deal With Old Age?